Tracey Knox received her Bachelor of Business Administration from the University of Michigan in 1990. Tracey worked for five years as a pharmaceutical sales representative while earning her Master Degree in Health Care Administration from the University of Detroit Mercy; graduating in May 1996. She did a post graduate health care administration fellowship in St. Louis, Missouri with the Barnes Jewish Healthcare (BJC) System for one year. Tracey returned to Detroit and worked in the Marketing Department with the former Botsford Hospital in Farmington Hills for three years. 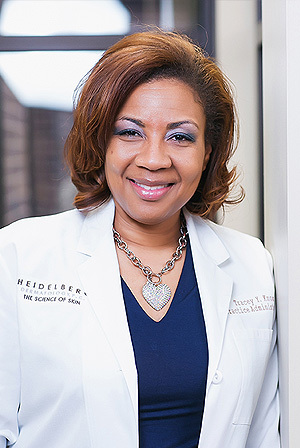 Tracey joined Heidelberg Dermatology, P.C. in September 2006. She is primarily responsible for managing the patient registration, scheduling and billing process. In addition, Tracey ensures the practice is in compliance with the governmental mandates for our Electronic Medical Record (EMR) and quality measures. She is a member of the Association of Dermatology Administrators and Managers (ADAM). Outside of the practice, Tracey is chairperson of the Health Ministry at her church in Detroit and an active member of Delta Sigma Theta Sorority, Inc. She also enjoys watching football, shopping, traveling and spending time with her daughter and twin boys.